Just a short line to say that, after a short break, Oldies Paradise is now back on the air. We broadcast oldies from the Rock'n'Roll era through to the early '80s and we certainly "dig much deeper" than your average oldies station! We are also time-shifting our programmes to make them more accessible to the North American market. The Doobie Brothers have not missed a beat in the past 40 years. They sounded and looked as good as they ever have, and fed us hit after hit after hit for over two hours. In every manner of speaking, it truly was like turning the clock back to 1973. Kicking things off with "Jesus Is Just All-Right With Me", and running through most of the Tom Johnston / Patrick Simmons hit catalog (including a number of classic album tracks along the way ... and three NEW tunes from an album they released about a year and a half ago), The Doobies provided a night of non-stop, stand up and cheer rock and roll entertainment. That being said, their new material sounds every bit as good as their old material ... too bad the current state of "tunnel-vision" radio has chosen to ignore it ... the three new tracks they featured Friday night played PERFECTLY along side the band's best-known hits. It's a real shame that you have to go see them in concert in order to get the chance to hear any of these great new tunes! As I suspected they might, The Doobie Brothers completely ignored the Michael McDonald era, a span of seven years that afforded the band their greatest, universally commercial success. Bypassing the Grammy Winning #1 Hit "What A Fool Believes" in favor of more classic album tracks, their ONLY acknowledgement to McDonald Friday Night was a surprisingly strong version of my personal favorite Doobie Brothers song, "Takin' It To The Streets", which showed a side to Patrick Simmons' vocals that I had not seen or heard before. It was outstanding! Other musical highlights included a BEAUTIFUL reading of "South City Midnight Lady" (another one of my all-time favorites) and an inspiring instrumental jam featuring a guitar duet between Patrick Simmons and John McFee ... for whom I have a whole new level of respect and appreciation as a virtuoso guitarist. Honestly, McFee impressed us all night long with his musical talents, but was exceptionally strong on this track as he played harmonics that I didn't even know existed up and down the guitar neck. To take on a piece this demanding and challenging night after night in concert is a true testament to both his musical ability and confidence ... he truly blew me away! The music presented by founding members Tom Johnston and Patrick Simmons DEFINES "Classic Rock" ... their songs have never left the radio and sound just as fresh today as they have for the past 40 years ... and it was quite clear that it is THIS combination of Doobie Brothers music that best exemplifies the band. Simply put, radio and the music of The Doobie Brothers have been very good to each other ... and the band acknowledged this happy pairing on stage when they thanked The Drive for all of their support for the past eleven years. Kudos again to The Drive who, year after year, CONSISTENTLY put the music and the listeners ahead of everything else. (Fittingly, the ratings reflect this bond between the loyal listeners and the station ... which is not always the case in radio today.) This was their 11th Birthday Celebration and for the majority of those years, they have thrown a birthday party where all of the "presents" go to the listeners. EVERY ticket to Friday Night's concert was a free give-away ... and, while it goes without saying that it's ALWAYS great to win a free ticket to a concert, I can tell you that THIS crowd was different ... this was a VERY special audience Friday Night that was thankfully chock full of REAL, long-time Doobie Brothers fans who spent most of the evening up on their feet, singing along with every single word of every single song, including some of the less-familiar album tracks. How exceptional and gratifying that THESE are the fans that were rewarded with tickets to this amazing show. The chemistry between the band and the audience was unparalleled ... safe to say that EVERYBODY in the theater that night had an exceptional time! Everyone is talking about songs they hear in the new great new Beach Boys tune, such as "Silhouettes," "Midnight Cowboy", "You Belong to me" and even the Beach Boys' own "Good Timin" but THIS is what I hear when I listen to this great new tune (co-written by Jim Peterik of the Ides of March!). THIS is why God made the radio FOR ME. PS. Listen to whole song HERE in case you have already heard the song. It's good to know the Beach Boys have quit quarreling long enough to get back together for their 50th! Attached is a 10 minute news story of them on the CBS Sunday Morning News ... really interesting but also kind of sad. BTW, I saw them two nights ago on Jimmy Fallon, and besides performing (with their cast of thousands, because they can no longer make music that sounds even decent without the real musicians that are doing the vocals and instrumentals), Fallon invited Mike Love and Brian Wilson up on stage with him. I couldn't believe Mike Love had to hold Brian Wilson's arm and guide him (oh so slowly) to the onstage couch ... Brian can hardly walk and looks deathly ill.
Also attached is a heartbreaking CBS Sunday Morning News Story about Glen Campbell and his ongoing losing battle with Alzheimer's. As you know, or maybe not, he's doing a farewell tour. He couldn't do it without the help of his kids ... his daughter is the banjo player and keyboard player, one of his sons plays drums and the other plays guitar. As you'll see, without them, the show definitely couldn't go on. In both clips, it will remind you how old we're all getting and what a great gift life is as well. Hope you're all well and God Bless! We've been telling you about the re-release of The Beatles' First U.S. Concert Appearance, playing for a limited engagement at selected series across the country ... but apparently these exclusive showings have been "postponed" ... for legal reasons brought about by Apple ... more details to come! Meanwhile, let me tell you about some OTHER exciting theater news coming your way if you happen to be in the L.A. area. On June 17th, you can catch a special screening of the classic film "The Monterey Pop Festival" showing at The Silent Movie Theater ... and the coolest thing of all is that it'll be hosted by Lou Adler and Michelle Phillips, two of the folks who helped make this whole dream come true back in 1967! It's the 45th Anniversary of the festival that launched the whole rock festival explosion ... and there are ALL kinds of other tie-in celebrations surrounding this anniversary as well. I agree about the Ravi observation. And when Pennebaker saw the raw Ravi footage he said he had his ending. The Monterey Pop Festival was the beginning of the future and potential of our music. It was the first of the festivals. It realized the idea that our music can not only entertain - but it can edutain, inform and unite. It set an example whereby a festival can create a platform from where our artists and their music can give thanks and give back. I am not sure if something as lofty as this was the total original intention - all of the participants in the Monterey Pop Festival were good fortuned people who had made of a success in the world of music - and I think we were all looking at the Monterey Pop Festival as a way of taking the game to the next level; for our own sakes as much as anybody's ... it was just a logical way of staying stimulated, staying engaged. The example it set, the gateway it opened has one intensely grateful that when Lou & John first pitched the idea to us, all we all said, "Count me in." I've helped out a few Kickstarter projects in my day but this one seems painless. For $20, they'll send you a DVD of the movie when it's out. You probably couldn't buy it for any less. I don't know who Andre 3000 is, do you? Meanwhile, Bob Merlis warns us that NOBODY'S going to be playing Jimi Hendrix in a motion picture unless the family gives its blessing first! Various media outlets have recently published accounts that indicate a feature length Jimi Hendrix biographical film is nearing production. Experience Hendrix, LLC, the family-owned company entrusted with safeguarding the legacy of Jimi Hendrix and administrator of the Jimi Hendrix music and publishing catalog has made it known many times in the past that no such film, were it to include original music or copyrights created by Jimi Hendrix, can be undertaken without its full participation. Experience Hendrix CEO Janie Hendrix, sister of Jimi Hendrix, and the EH board have not ruled out a "biopic" in the future though producing partners would, out of necessity, have to involve the company from the inception of any such film project if it is to include original Jimi Hendrix music or compositions. Prayers and best wishes for a full recovery to Sonny Geraci. 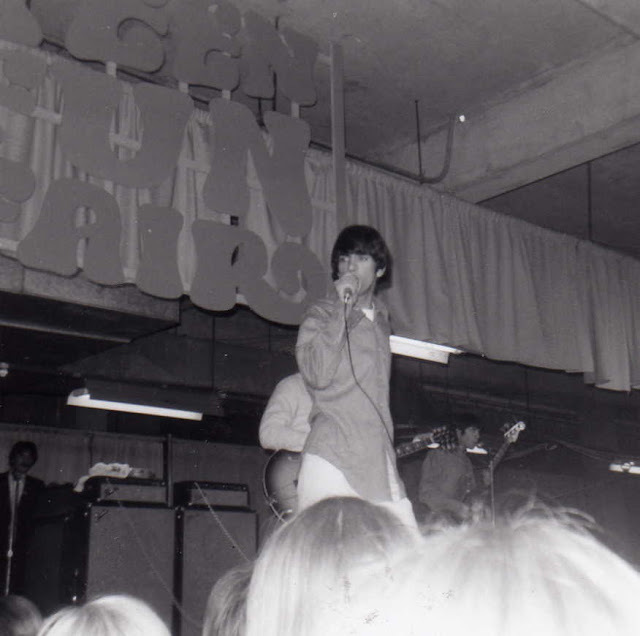 Here's a photo from the 1967 Omaha KOIL radio Teen Fair with Sonny belting out an Outsiders goodie! Out June 12: Jimmy Fallon, Sir Paul, the Boss + more. I agree with your assessment of IF YOU GOT TO MAKE A FOOL OF SOMEBODY by Freddie and the Dreamers. I played some 20 seconds of it and then hit the 'reject' button. I checked and James Ray's version peaked at number 12 here in OKC in December of 1961. I always did like his followup as well, ITTY BITTY PIECES, through the courtesy of Caprice Records. Had this information written on a separate piece of paper. Throughout the late 1970's, Glen Sherley struggled to cope with stardom and he quickly faded out of the limelight. He ended up working for a large Cattle Company, feeding 10,000 cattle a day. He lived in the cab of his semi truck. Under the heading of "Imagine there were no Beatles", I have an equal or greater question to ask. And that question is "WHAT WOULD YOU DO IF THERE WASN'T ANY ROCK AND ROLL?" Without going into specifics, you have to go back to, I believe 1959 for the answer. It's been lulls like this in music that have helped to create "the next big thing" ... 1959 very well may have been one as far as true, good old rock and roll may be concerned (as we entered the era of the teen idol, with manufactured stars like Frankie Avalon, Bobby Rydell and Fabian ruling the charts) ... and certainly late 1963 was another (using our example of The Singing Nun and Bobby Vinton.) That doesn't mean that each of these artists mentioned didn't deserve to have a hit record ... it simply means that there was nothing going on here to set the world on its ear the way Elvis and The Beatles did in the mid-'50's and mid-'60's. Let's face it ... an Elvis or a Beatles doesn't come along every day ... which only magnifies their impact when it happens. Folks knew who Michael Jackson was for nearly 15 years before he EXPLODED on the scene with the whole "Thriller" thing. Likewise The Bee Gees, who had multiple hits in the late '60's and early '70's ... then blew the doors off the charts with their late '70's "Saturday Night Fever" material ... and Fleetwood Mac, once a British blues band with a bit of a cult following before they added a couple of female vocalists and a whiz-kid on guitar that catapulted them into the stratosphere with albums like 1975's "Fleetwood Mac" and 1977's "Rumours". >>>I would advise people not to buy Irene Brodsky's book unless you're a die hard Johnny Maestro fan. The book is 49 pages long. Most of it is pictures and illustrations. Sounds like you were too kind in this review. Naturally, we heard from Irene after we published the negative reviews the other day. Again, as I stated then, I have not personally seen or read the book ... so I can only go by the opinions voiced by those who have ... and they came away feeling disappointed and short changed, especially after shelling out $11.95 for less than 50 pages. Maybe you should charge $11.95 for each weekly edition of your Sunday Comments Page. Please understand that complimentary books take time to receive ... and I will have copies next week. I made a promise to send you one and I meant it. The man who won the contest received my own copy of the book. As a "seasoned" writer of 12 years, I am used to good and bad reviews. It is a writer's expectation to expect good and bad reviews but these reviews were very unnecessarily cruel. I think you should not have posted them without considering the harm it can do to me as a very respectable writer and professor. They made me look as if I was cheating my readers, which is not true. On the website that I sent you to, the price is not $11.95 It is reduced to $9.55 by my agent. And when people used to buy the book directly from me, it was $10 (including shipping) ... and, by summertime, it is going on Kindle for $9. I must say there was a lot more to write about Johnny, but it was gossip, rumors, his illness, lack of proper treatment, etc. When I received Mrs. Maestro's blessing to write this book, I took that blessing very seriously and put together what I felt was acceptable to all ages, to libraries and to book stores and out of the greatest respect to Mrs. Maestro, who has been more than kind to me. The info in my book is everything that I was able to obtain that did not contain gossip, innuendo or rumors. Mr. Maestro was a private person ... and very humble ... and did not share details of his personal life. I tried to get his children to share their memories of their father, but that did not happen. I tried to get his background group to meet me for an interview of their memories of being on the road with Johnny and that did not happen. I also had to spend many months searching for people who owned rights to the 11 original photos in this book ... some were as far away as Australia. I tried to meet members of the Crests and was told they were no longer alive, etc. This was a 13 month labor of love. My next book is about Jonathan Frid (also known as Barnabas Collins of Dark Shadows) and there will be no gossip, no rumors, or how he died ... it will be about how he rose to fame from his college days as an actor of Shakespeare Plays. It should be even harder to deal with because he never gave interviews and never talked about his former life before Dark Shadows ... and he had no wife for me to "butter up" ... but I will give it my best try with the help of his fan club of 70,000 people from all over the world and one nephew from Canada. I am always glad to hear from you. New books are coming next week. If you get a chance, could you please ask Irene Brodsky a question for me? What's the point of having 12 numbered, blank pages? Why not have one numbered, printed page after another? I think I'm just going to let this one lie ... the point has been made regarding what the book contains ... and our only motivation (dare I say obligation) was alerting interested potential buyers as to what they could expect if they picked up a copy. With SO many Johnny Maestro fans on the list, many of them may not care ... they may simply want to devour anything they can get their hands on regarding this subject matter. And knowing that Johnny's widow endorsed the book may be a big plus for everyone. Check this out ... Johnny Maestro, being honored in Congressional Record. Cool! If Irene includes this in the second printing of her book, perhaps she can stretch it to 52 pages!!! On May 9, 2012, Johnny Maestro was honored by the House of Representatives of the United States of America. Congressman Jerrold Nadler of New York, whose district includes the neighborhood where Johnny was born and raised, and where he began his music career, introduced an Extension of Remarks to the House of Representatives. This posthumous honor is now a permanent part of the Congressional Record. early 1960's. I believe the group in question, The Five Whispers, recorded for Dolton Records, the same label as you know the Ventures recorded for. Whether the Five Whispers were the same group as the Ventures, I don't know. I believe through the years at times an artist or group would make a record using another name other than their own. I may have it on an album of mine but I will check later on. A number of years ago on Top Shelf Oldies I heard Dave The Rave play a KILLER 45 on the Gail record label called Is It Right by the Conquests. I ended up buying a copy of the 45 on ebay only to find that it had a huge scratch in what was supposed to be a mint unplayed record. I sent it back to the seller who offered me his only other copy of the 45, on what appeared to be an earlier pressing on a label that simply said "The Conquest". Of course I took it. Well, the only information I could find out was that it was written by a guy named John Rooney. Interestingly, I looked up Rooney on the BMI website and came up with nothing under his name, yet when I searched for the song by title, it came up with his name. It showed a publisher listing as "Ticklish Tunes, Inc.". It also lists an address in Chicago and a phone number, though googling those, the address seems to have a phone number that doesn't match the BMI listing (and the address appears to be a multi-business address anyway), and a search on the phone number comes up with an unpublished listing. However, my initial guess upon first hearing this song was that it probably was recorded in 1965, and I found on one website a listing for a "dissolved" corporation called Ticklish Tunes, Inc. which was formed in September of 1965 (It does not list when the company was dissolved). The address it was registered at is the same address found on BMI and the person who formed the company was someone named John Tolbart (full name John Burgess Tolbart), who, from what my research shows, passed away in 2005 at the age of 93 (Tolbart had apparently recorded Ral Donner early in his career at his studio). So my research has me at a dead end ... I have no way of contacting the songwriter, John Rooney, since the publishers information on BMI is clearly long out of date, or finding out any information on group members (assuming Rooney was one even of the group members, as Is It Right is listed as his only songwriting credit -- a damn good song to write if it's going to be your only one, if you ask me). Perhaps you can "put this out there" and see if any of your Chicagoland readers might be able to come up with anything for me? I'm also sending you the song as I think you'd really enjoy it (for all I know maybe the record got played in Chicago or maybe the group did live gigs around Chicago and it might bring back memories for you or any other local residents). Without question, there isn't a single contributor to Forgotten Hits who has solved more of our musical mysteries than Tom Diehl ... so here's hoping we can in some small way repay the favor with this one. Is this a physical jukebox that sits in a business, such as a restaurant or club? If so, the royalty situation shouldn't be too different from anything such a venue is (or should be) familiar with. You'd think they'd index where a song might be on the net so it can be played promptly, as is usually the case with those devices. You made a good point about downloading a song for $0.99 cents instead of playing the Jukebox. If you're sitting in a bar with friends, you only have two choices ... play the Jukebox or have no music. I want music. >>>June, 1960, saw something that, as far as I'm concerned, is one of the oddest quirks of the Billboard Hot 100 pop music charts. A British singer named Garry Mills entered the charts then with "Look for a Star," a tune that had originally been used in the 1960 Donald Pleasance film "Circus of Horrors." At exactly the same time, an American singer named Garry Miles also entered the charts, also with a similar-sounding version of "Look for a Star." Both versions climbed the charts simultaneously, although the one by the American singer both outlasted and reached a higher position than the British singer's. Here in OKC Garry Miles' version of LOOK FOR A STAR peaked at number 12 in August of 1960. Now on the survey, it shows an alternate version but this is Billy Vaughn's instrumental version. No listing of Garry Mills on survey as well as Dean Hewley who also had a version out on Dore records. According to Billboard, "Young Love" was a hit for Sonny James and Tab Hunter in January of 1957. Both versions were on the Charts for 17 weeks. Both versions hit #1. Isn't that unusual? Both versions out at the same time make it to the top of the Charts? Here's the part that shocks me. Sonny was #1 for one week. Tab was #1 for six weeks. this song. I don't see how any impartial observer can say that Tab sang it better than Sonny. Listen to both of them and let me know what you think.